Canada is pushing hard to deepen trade ties with China, as evidenced by a delegation including four federal ministers and three provincial ministers in Beijing earlier this month. But alarm bells are ringing as concerns about China’s integrity mount and Canada’s democratic allies take action to address the Chinese regime’s conduct. Canada appears to be zigging when it should be zagging. Canadian exporters may be pleased, but the big picture is murky to say the least. On a conference call from Beijing on Nov. 12, Minister of International Trade Diversification Jim Carr, along with Finance Minister Bill Morneau, said the latest trade mission was part of an ongoing dialogue and long-term objective. The Liberal government ultimately envisions a comprehensive free trade deal. But for now, the ministers beamed about the $1.67 billion in commercial deals signed by 48 Canadian companies during the China International Import Expo in Shanghai from Nov. 5 to 10. Canada’s Prime Minister Justin Trudeau and China’s Premier Li Keqiang met in Singapore on Nov. 14 and welcomed the results of the trade mission in China. China is Canada’s second-largest single-country trading partner. In 2017, two-way trade between the two countries reached nearly $94.5 billion, or 8.4 percent of Canada’s total merchandise trade. But as Canada has been importing more from China than it exports, the trade deficit sits at $22.8 billion—a sign that trade is tilted in favour of the Chinese. Carr wouldn’t characterize the meetings as focusing on sectoral trade, or that it was something mutually exclusive from comprehensive free trade. “This is a series, it’s a continuum, it’s a progression,” he said. But according to J. Michael Cole, a former intelligence officer with the Canadian Security Intelligence Service (CSIS) and now Taipei-based senior fellow with the China Policy Institute, Ottawa does not appear to understand the urgency of joining democracies led by the United States to pressure China to reform its conduct in international trade. 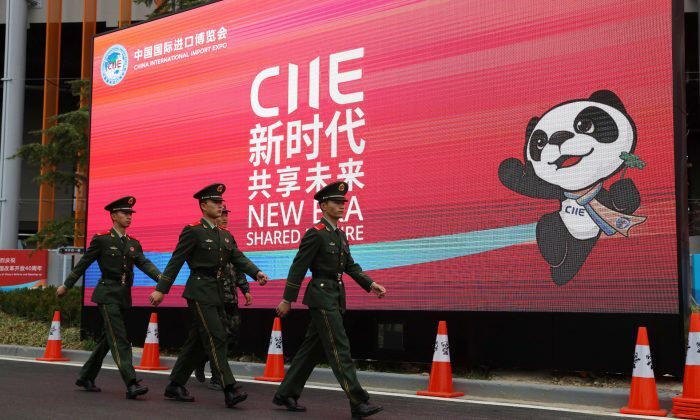 Cole is the author of the Macdonald-Laurier Institute publication “The Hard Edge of Sharp Power: Understanding China’s Influence Operations Abroad,” in which he discusses China’s political warfare as it seeks to expand its authoritarian regime. The report includes recommendations to protect against external influence by the Chinese Communist Party (CCP). “Even as we negotiate trade deals and our businesses look to China as an alluring market, our societies need to weigh the benefits of continued business-as-usual engagement against the costs to the democratic values we cherish,” Cole wrote in a Macleans editorial. The timing of the trade mission is awkward given the ongoing trade war between China and Canada’s top trading partner and democratic ally, the United States. The concerns about the Canadian government’s approach toward China are similar to those expressed by White House trade adviser Peter Navarro in a Nov. 8 speech at the Center for Strategic and International Studies. He lashed out at Wall Street executives for pressuring U.S. President Donald Trump to end the trade dispute with China and for visiting and being wooed by Beijing. Like Cole, Navarro is concerned about Trump’s negotiating position weakening if China is able to find a means of escape through Canada. The Canadian government published a list of outcomes on Nov. 12 from the Morneau and Carr meetings, but it did not include any mention of stopping cyber espionage or theft of intellectual property. The word “cooperation” is mentioned 31 times, including on trade-related IP issues. There was no mention of gender equity, human rights, or respect for the environment, which were asks Trudeau had for the Chinese regime last December. Morneau and Carr also addressed the Canada China Business Council in a meeting from which the media were banned at the request of Chinese officials, according to the CBC’s Sasa Petricic. It appears the Chinese authorities are dictating proceedings and not being taken to task as the United States endeavours to do. “The task of any government, Trudeau’s or any other government is to reconcile values with strictly commercial interests,” said Eric Miller, president of the Rideau Potomac Strategy Group, in an interview. Carr said there was “an awful lot of support among Chinese ministers for the Canada WTO [World Trade Organization] reform initiative” that took place in Ottawa in late October. That meeting hosted in Ottawa by the trade minister and attended by 12 other nations—other than China and the United States—aimed to update the dispute settlement system and improve the effectiveness of the WTO monitoring function. The meeting aimed to build consensus among the smaller trading nations. “The Chinese are absolutely committed to a world system that is rules-based,” Carr said. The Chinese are talking the talk, but history has shown that they haven’t walked the walk, certainly as it relates to WTO rules. Morneau extolled the virtues of trade with China for creating more middle-class jobs, but the Centre for the Study of Living Standards recently reported that the loss in manufacturing jobs in Canada directly attributable to Chinese imports from 2001 to 2011 amounted to 114,000. Cole said Ottawa risks becoming the weak link in the alliance of democracies. “We have to decide if markets and money are less important [than] the upholding of our democratic rights—and those who would threaten to undermine them,” he wrote in the Macleans editorial. Canada seeks foreign capital to fund its infrastructure projects and to add greater expertise to the Canadian knowledge base, but one potentially undesirable byproduct to deeper economic relations with China is investment by its state-owned enterprises (SOEs). Canada already rejected the takeover of its infrastructure and construction giant Aecon by a Chinese state-owned construction firm due to national security concerns. SOEs can also distort competitive markets as their motivations are not consistent with those of private companies. “We will examine those [SOE] investments to make sure that there are no security or other challenges for the Canadian economy,” Morneau said. As part of a deeper trade relationship, China wants to secure greater access for its SOEs in Canada, while minimizing the competition they face domestically. The Organisation for Economic Co-operation and Development (OECD) ranks China 59 out of 62 countries for openness to foreign direct investment (FDI). Canada is expecting “timely implementation of announcements by China on further market opening.” The lack of reciprocity is one of the major complaints levied against China, and is also illustrated by the trade deficit. Canada and China are determined to forge deeper ties with the focus being agriculture and energy. Canada wants to double agriculture trade with China by 2025, as the United States and other democratic allies tighten the vice on China.